This region begins on the outskirts of Buenos Aires and is an obvious destination for many people. In addition to the capital, there are many natural and urban sites to visit in the area such as an estancia or a coastal resort. Las Pampas is the heart of Argentinean criollo culture, home of the gauchos and birthplace of the asado. Any visit to Argentina would be incomplete without experiencing this aspect of its traditional culture. The Atlantic Coast and Pampas include the provinces of Buenos Aires and La Pampa and constitute the central heart of the country. The region is limited on the east by the Atlantic Ocean, which gives this region one of its greatest appeals: hundreds of kilometers of beaches. The inland is characterized by the extensive plains known as las pampas, where Argentina’s renowned cattle is raised, and acres upon acres of flat land are left to nature. The Atlantic Coast is home to many beach resort towns, the most famous being Mar del Plata, where the porteños spend their summer vacations. Both a large city and a beach, it has everything a vacationer might need. 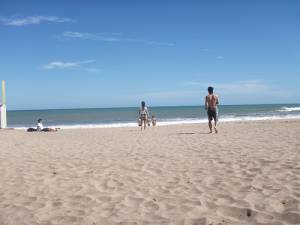 Along the coast are also several other smaller beach resorts, such as Villa Gesell or Pinamar. The pampean plains cover the most extensive part of the region, with the exception of a small mountain range to the south of the province of La Pampa. This region is home to the gaucho culture, the Argentinean version of cowboys that developed in the 18th century when cattle raising became generalized. They are an essential part of the Argentinean national identity, as they represent the freedom of the criollos forced into the plains, surviving in spite of harsh conditions. There are a great many estancias, or farms, scattered throughout the area, many of which offer accommodations. Closest to Buenos Aires is the town of San Antonio de Areco, which is the capital of traditional Argentine culture. Gaucho lifestyle is celebrated here, and in addition to a great variety of estancias there are many handicraft markets and traditional festivals throughout the year. The region holds many more natural areas of great beauty. To the south of La Pampa are the Sierras de Tandilia, mountains that lay by the city of Tandil, known for its natural scenery and gastronomy. There are many boulders in the area, and breathtaking views of nature from the mountains. The best cheeses and sausages of the country are also said to come from this area! The Lihue Calel National Park is also worth a detour for travelers with a rental car. In a low mountain chain, it harbors unique wildlife as well as most of the archeological remnants of Argentina. Close to Buenos Aires there are two cities are of interest: La Plata grew during the 19th century, in the midst of Argentina’s economic prosperity. It has a great numbers of museums, and a cathedral. The city of Lujan is the site of a yearly pilgrimage to the Our Lady of Lujan Basilica. This page rendered in 0.326 seconds.